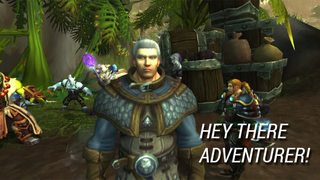 No matter where you are in the new zones of World of Warcraft, Khadgar, the main NPC of the expansion, will pop up randomly to bug you. He's everywhere. Thanks, MMO mechanics. Slightly Impressive's recent machinima is about him and about other, similarly elaborate observations of Draenor. The folks at Blizzard might've realized there's just too much Khadgar in the game, though, because he engages in some serious self-criticism during during the legendary ring quest line by saying: "As powerful as I am, I cannot be everywhere at once." Also, new models make everything weird.